Aga Khan Museum will prove to be of historic significance: Siddiqui 2014-09-10 | Ismaili.NET - Heritage F.I.E.L.D. It represents a historic turning point for Canada — sending a bold political and social message of peace and pluralism to the world at a time of fraught relations between the West and Islam/Muslims. The museum is to be inaugurated on Friday, a day after the 13th anniversary of Sept. 11, 2001, and amid daily accounts of terrorism and wars in Syria, Iraq, Afghanistan, Pakistan, Nigeria and elsewhere. The museum, which opens to the public Sept. 18, offers the beauty and diversity of Islamic cultures and civilizations through the ages. England’s loss is Canada’s gain. This is no ordinary museum. •It has not cost Canadian taxpayers a penny. •It is an architectural jewel, inspired by great Islamic structures and taking its inspiration from the Qur’anic theme of light, “God is the Light of the Heavens and the Earth,” light that basks all humans equally, and that lights up the heart and soul, etc. It uses the familiar geometric patterns of Muslim lands to let in all the light possible. But it has no minarets and no huge domes. •The museum is the first in the western world dedicated to Islamic arts and objects. 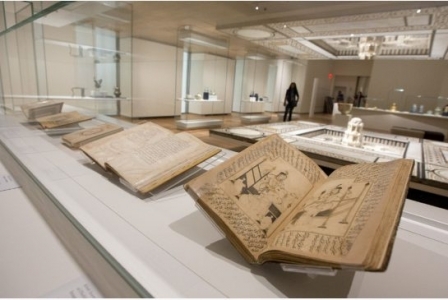 It houses the Aga Khan family collection of about 1,000 rare objects, spanning from the 8th to the 20th century. About 300 will be on display at any given time. Concurrently, there will be two temporary exhibitions showcasing arts from Muslim lands. First up: Contemporary Arts from Pakistan, and one introducing great Muslim artists through the centuries unknown in the West. •The museum aims to “bridge the growing divide of misunderstanding between the East and West,” says the Aga Khan, 77. It showcases the diversity of Muslims not only by race, language and ethnicity but also by civilizations and theological orientation, such as the majority Sunnis and minority Shiites and sub-sects, and differing interpretations of the Qur’an. •The museum will also hold concerts, movies, festivals, seminars, etc., at its 350-seat auditorium. Many newer Canadians would be able to see themselves in the programs in a way that “I couldn’t see myself growing up in Vancouver,” says Amirali Alibhai, head of performing arts. •New museums must slowly build their reputation but this one comes with one. It brings here what’s already well-known, having been exhibited in Geneva, Parma, London, Paris, Lisbon, Toledo, Berlin and elsewhere. The project spotlights both the Aga Khan and his Ismaili community, and Canada’s increasing partnership with them. He is an honorary companion of the Order of Canada as well as an honorary Canadian citizen. Canada is a partner in many of his initiatives for advancing economic development in some of the poorest parts of the world: building schools and universities; restoring historic Islamic cities, sites and gardens; and advancing architectural excellence (through the prestigious Aga Khan Award for Architecture and the Aga Khan Program for Islamic Architecture at Harvard and MIT, Boston). He runs a mini-United Nations, with its own small diplomatic corps under bilateral agreements with several states. Of his 11 “representatives,” ambassadors, four are Canadian — Nurjehan Mawani, Aziz Bhaloo, Munir Merali and Shams Lakha. A fifth, Firoz Rasul is president of Aga Khan Universities. The Don Mills project follows the Aga Khan’s Centre for Pluralism, Ottawa, designed to distil Canada’s multicultural wisdom and export it to the world. (It will be shifted to the Canadian War Museum, which he is restoring.) Ottawa is also the locale of an Aga Khan “delegation,” i.e. embassy. There are about 12 million Ismailis, including about 90,000 in Canada. They are a cohesive unit — prudent, modest and obedient to him (in sharp contrast to most Muslims who revel in their bombast and democratic chaos). The Ismailis are one of the most successful examples of integration into Canada, in no small measure due to the Aga Khan, who guides them both spiritually and in worldly matters.